Choosing a Tandem Axle Trailer Tire Jack: Wood, Polymer, Steel or Aluminum? 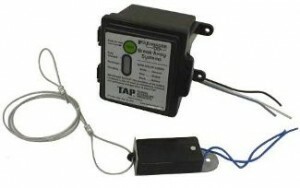 The Trailer Breakaway System is designed to bring a trailer to a safe stop by activating the electric brakes on the trailer, should the trailer be disconnected from the tow vehicle while driving. You must have operational electric brakes on the trailer, the 12 volt battery must be charged& the switch cable must be attached to the vehicle. Battery: At the front of your trailer is a black plastic case that holds a 12 volt battery. There are two wires connected to the battery at the top. One wire is the “ground” wire. The second wire (hot) connects to the breakaway switch. If there is a third wire, it’s hooked to a small charger that charges the battery off the tow vehicle, through the trailer plug. If there are only two wires, there is no way that the battery can be recharged from the tow vehicle, and you must charge it by hooking an electric or solar battery charger to it. Or, you can install a small maintenance battery charger inside the battery box. These 12 volt batteries often have a life of only two years, and since new batteries are not always fully charged, you must charge them before connecting the system. If you have a charger installed, it can charge the battery by plugging the trailer plug into a running tow vehicle for twenty minutes. Check the battery charge frequently. The entire battery can be depleted if the pin is pulled out of the switch for 20-25 minutes, IF it’s fully charged. If it’s not fully charged, it can deplete in 10 minutes or less. When checking the charge on the battery, first disconnect the trailer plug or you will be checking the tow vehicle’s battery charge instead. Switch: The breakaway switch is wired to the battery in the battery case & is mounted between the battery and the tow vehicle. It contains a pin that is attached to a wire cable, 44-48 inches long. Pin & Cable: The pin must be inserted into the switch, facing the rear of the tow vehicle, with the attached wire cable in a direct path to where you secure it to the tow vehicle. The wire cable must be fastened to the tow vehicle independently. Never loop it through the safety chains! If the cable is not attached to the tow vehicle, the breakaway system will not work in case the trailer becomes disconnected from the tow vehicle. Pulling the pin out ANYTIME depletes the battery, and that’s why we recommend clipping the cable to the tow vehicle with it’s own clip. We never pull the pin from the switch, except to check if the switch is working or if the battery is charged. WHY is it important to have your breakaway system working? There are several ways the trailer can become disconnected from the tow vehicle. An accident or a mistake in hitching the coupler to the ball can cause the safety chains or ball mount to break or come out of the receiver. If that happens, the heavy trailer with your animals in it could roll into oncoming traffic or into a ditch and land on it’s side. If your breakaway system is working, the second the trailer becomes disconnected, the pin pulls out of the switch & engages the electric brakes ---and the trailer STOPS. This gives you between 10-25 minutes to chock the tires and stabilize the trailer before the battery charge depletes. Question...If the emergency breakaway system safety pin breaks in half inside the switch box, but the other half of the safety pin is still in place holding the prongs open can the breaks still lock up at any time. Nope. The broken end of the pin that is still in the switch will hold the prongs open & the brakes will not engage unless the pin is pulled all the way out. Once the pin is pulled out, the brakes will engage for about 20 minutes or until the battery dies. So, if there is no pin & the trailer is rolling fine, it means that there is a dead battery.